Game Day. We’ve waited 9 long months for the next kickoff. Jerseys are washed. Mouth guards are ready. Chin straps are snapped in place. Knee braces are fitted. Cleats are broken in. Plays have been drawn. Gatorade’s are on ice. Fans are eager. It’s time. There is nothing like the Friday Night Lights of high school football. For many young men, it sets a foundation for the rest of their lives. The games, practices and coaches leading them into battle instill valuable principles carried throughout the rest of their lives. I talk with grown men all the time who tell me the best part of high school, was playing football. It’s ironic that they struggle with remembering two or three items we ask them to grab at the grocery store or our anniversary, yet they can recite scores (and even specific plays) from games played fifteen years ago. The moments on the gridiron stick. The bonds, their relationships with fellow players or coaches and the memories last a life time. It is the ultimate brotherhood. Football is tough. But so is life. Football is complex. But so is life. Football is pressure. But so is life. Football teaches us to never give up and that it’s never too late. And it teaches us that miracles are possible. Fans going crazy for the boys of fall. Sports unify people. Communities talk about the season, the game, the players and the excitement around which opponent is next. Fans talk high school football at work, social gatherings, church, BBQ’s, on chat forums, and in the grocery store. We are proud of where we come from and proud to represent. It is more than a game- it is a social event. Connections are made with other parents, neighbors from around the block and old friends. New friendships are formed sitting in tailgate chairs and on stadium bleachers. There is a genuine love and desire to see the team do well. Season after season, win or lose, through thick and through thin, we love our team. It’s fighting back them butterflies. Yes, I know I’m a therapist, which sends fear in the hearts of those who think of feelings as the “F-word”. Some people struggle with expressing their feelings, be them happy or sad. But, at a high school football game, fans jubilantly throw their hands up in the air when someone scores a touchdown. Others (like me) are nervous wrecks, pacing and sweating all game. During the game, high-fives are given to strangers and hugs of happiness are shared after an important win. And when a team loses, disappointment or sadness is okay. Tears are shed, and emotions are worn on the sleeves of both the fans and the players. Experiencing and expressing feelings are an important part of life, and sports allows both. They didn’t let anyone in that club. Both my boys have been on teams where they stood on the side lines cheering for their teammates and on teams where they were starters and had a major role in the outcome of game. Either way, my heart was bursting with pride. Playing time does not equate to value or worth. Every team member is important, and every team member contributes. I’m proud of them for believing in something so passionately, for earning their spot in the club and seeing that whether they played in the game or not, they were part of something special. Took every ounce of heart and sweat and blood. I don’t need my son to be THE man, I just want him to learn to be A man. Both of my boys are offensive linemen. It’s a selfless job. Their sole job is protecting someone else. O-linemen get no praise, no glory and little appreciation. (Sound familiar parents?) They are the blue-collar workers, showing up every game, without flash or limelight and just doing their job. They know that they are only as successful as those around them, so they respect the tribe. They are the ultimate team player. Football is preparing my boys to be great fathers, protectors and husbands. It is also teaching them that nothing of value comes without hard work, sweat, commitment and dedication. Football is molding them into men who have self-discipline, know how to compete, respect authority, hustle and accept accountability. The game has taught them that growth and success require sacrifice and commitment. They will be better employees, better co-workers, and better parents because the qualities they learned playing football matter. You mess with one man, you got us all. When high school football is done, and players move on, many seek that same brotherhood they felt in high school. Old players will tell me they joined a fraternity or a rec team because they miss the camaraderie and fellowship they found in their high school football team. Others join the military or professions like fire-fighting because it carries the same kind of brotherhood they felt when they took the field on Friday nights. Knowing the band of brothers is behind you, besides you, has your back, and truly cares about you is life changing. It’s a rare thing to know that you are part of something that is bigger than an individual. Players are not just teammates, they are family. 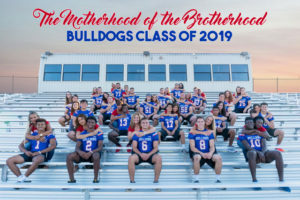 Those that say you can’t chose family, underestimate the meaning of the brotherhood and the power of the football family. Boys of Fall, we are ready for you. We believe in you and we are proud of you. When you take the field tonight, know that your family is behind you, your school is behind you, your town is behind and your brothers are behind you. Tears again on this commentary. It’s beautifully written, heart-felt and true. Absolutely one of my most favorite songs and this mom loves football too! Will miss my favorite #30 not being on the field anymore but will still be there cheering on our Bulldogs! Loved the picture and the message was tear inducing. so thought and memory producing. Well said. There is no better place for young men to learn who they are than when they are in conflict and having to rely on someone else to do their job. Football is the ultimate team sport and you must rely on others as they are relying on you. Thanks for putting this thing called sports in perspective.